Earlier this summer, Donald Trump released a one-page summary of his net worth and a 92-page Federal Election Commission filing. The financial media have been skeptical, accusing Trump of exaggerating his wealth. Forbes attempted to reverse-engineer how much Trump is worth, arriving at a $4 billion valuation, less than half of the “TEN BILLION DOLLARS” Trump had claimed). I have tried a different approach, a technique based on the fact that exaggerated numbers are statistically different from honest ones. This is a type of analysis that is already being used by forensic accountants, tax agencies, and lenders to detect financial fraud. Psychologists have known for some time now that when people make up numbers, they fall into telltale patterns. This has been demonstrated in the psych lab and in the real world. Consider Bernie Madoff. He and his minions invented reams of fake investment returns that were sent out to investors. These bogus numbers differed from real numbers in several ways. One is that fakers overuse some digits and underuse others. They avoid paired or tripled digits (like 33 or 888) in big numbers. They overuse descending sequences (like 321 or 876). Fakers repeat themselves without realizing it. Madoff over-used the digits "86" in his claimed investment returns. Oddly enough, he also favored 86 in the golf scores he reported to the handicap association. Madoff was a complete fraud, but much more common in the business world are exaggerated numbers. Enron was notorious for claiming revenues and earnings that narrowly exceeded round numbers. For instance, in 1997 Enron reported revenues of $20.373 billion. A number like $20-plus billion “feels” bigger than $19 billion, say. So Enron’s accountants nipped and tucked and found ways to claim they’d just beaten a psychologically significant threshold. This boosted Enron’s stock price, up until the company crashed and burned in 2001. Now of course there’s nothing “wrong” with a number like $20.373 billion. You can’t look at that number, or any number in isolation, and say it has to be exaggerated. But a pattern of numbers narrowly exceeding round-number thresholds can become suspicious. Notice that, when a number just barely exceeds a round-number threshold, it will have a zero as the second digit from the left. You see that, for example, in the $102,000,000 that Trump says he donated to charitable causes in the past five years. Here 1 is the first digit and 0 is the second. To run the second digit test, you simply tally how many financial numbers in a set end in each of the ten possible digits. (Easier yet, you paste your data into a spreadsheet—Nigrini has a free one online—and follow some simple instructions.) Provided that you have a lot of numbers, an excess of second-digit zeros can be a sign of creative accounting. An excess of 1s might also be diagnostic. Back to Donald Trump: I downloaded his financial disclosures. The FEC filing did not contain as many numbers as I’d hoped. For all the asset values and most of the income figures, the report merely gives a range, like “$100,001 to $1,000,000.” These aren’t helpful for this type of analysis. It was able to collect 57 exact income numbers, such as $2,087,379 for Trump Turnberry golf club. Other campaign disclosures yielded another 13 numbers, for a total of 70. 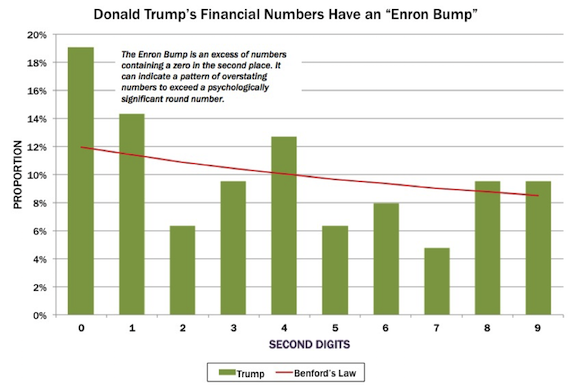 Aside from that “TEN BILLION DOLLARS” Trump claimed in his typically bombastic fashion, nearly all of Trump’s numbers are given to remarkable precision. We’re told, for example, that he earned $213,606,575 for 14 seasons of "The Apprentice." In my assessment, I excluded seven round numbers for speaking fees, such as $100,000; these numbers are not the sum of many smaller credits and debits, like the income from a casino or a golf course or a beauty pageant. You’d expect speaking fees to be round numbers, and thus the second-digit zero is not suspicious in the way that it might be in a number like $2,087,379. That left 63 usable numbers. That’s not a whole lot for this type of analysis. Ideally you’d want hundreds or thousands of numbers. Still, it is enough to detect a really pronounced pattern. I pasted the numbers into the spreadsheet, and it produced this bar chart of second-digit-test results. The bars show how many of Trump’s numbers have each digit in second place. For comparison, the curved line shows how many numbers would be expected to have each digit in second place. This comes from Benford’s law, named for a General Electric physicist who noticed that the ten decimal digits are not equally common in scientific and financial numbers. Frank Benford devised a formula predicting how often each digit occurs, at each position in a multi-digit number. In honest financial numbers, zero is expected to be the second digit 11.97 percent of the time. As you can see, Trump’s data have more numbers with digit 0 in second place than would be expected by chance. This “Enron bump” can be evidence of someone trying to top a psychologically significant round number. Where does this fall on the Pinocchio meter dial? With only 63 numbers, we don’t have a whole lot of statistical confidence. The chance of this second-digit zero result occurring by chance in honest numbers is 6.86 percent, or about 1 in 15. That’s a fairly high suspicion level—though surely in reasonable doubt territory for Trump. A venture capitalist presented with data fitting this pattern would be justified in asking for more numbers and more detail about how they were calculated. Let’s not be too hard on Trump. Studies have shown that the aggregate financial numbers of Fortune 500 corporations also contain an excess of second-digit zeros. Maybe the question to ask is how honest your own numbers are. Nigrini has consulted with tax agencies across the globe, who are evidently using similar techniques to gauge which tax returns are most audit-worthy. The data industry has already discovered that numbers may encode the secrets of our hearts. It’s not just reality stars who live in glass houses. William Poundstone is the author of "Rock Breaks Scissors: A Practical Guide to Outguessing and Outwitting Almost Everybody."